The formalized waza of Eishin Ryu Batto Ho were developed as standing forms to instruct new swordsman in the correct methods of Japanese sword drawing. The 12 waza are practiced today throughout the world and form the fundamental core instruction for those wishing to gain and assimilate proper movement and cutting technique. These waza were introduced in July, 1939, by the 20th Soke (the headmaster) Kono Hyakuren of the main line of Muso Jikiden Eishin Ryu in compliance with the request of the Dai Nihon Butoku Kai. The directive was to institute a training regimen for acolytes studying at the Budo Senmon Gakko, which had been established at the Butokuden, that was based on and drawn from the older koryu kata of Muso Jikiden Eishin Ryu. The Eishin Ryu Batto Ho waza sets are comprised of 7 basic (Shoden) forms and the 5 high level (Okuden) forms. The first seven waza are classified as Shoden level instruction and should conform to the Eishin shoden methods of body movement. The waza Shihoto Sono Ni was added to the curriculum by the 21st Soke, Fukui Seizan. The Shoden method establishes the correct positioning of the body during the nukitsuke, kirioroshi, chiburi and noto. This level of instruction establishes a base line for the mechanical skills needed when executing the Okuden method. 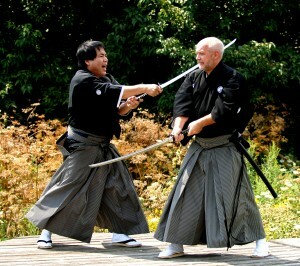 Shoden waza prepare the swordsman to correctly move and manipulate the timing and distance relative to ones opponent. The Eishin Ryu Batto Ho are now practised throughout the world by many members of the Dai Nippon Butoku Kai as well as the major MJER organizations. The grading criteria for achieving certifcation and rank in Eishin Ryu Batto Ho through the KNBK / JKI has made it possible for many martial artists from other budo disciplines to incorporate traditional sword training and grading into their schools curriculum. Here at Sakura Budokan we offer Eishin Ryu Batto Ho as a separate Sword art in addition to the Muso Jikiden Eishin Ryu koryu arts.